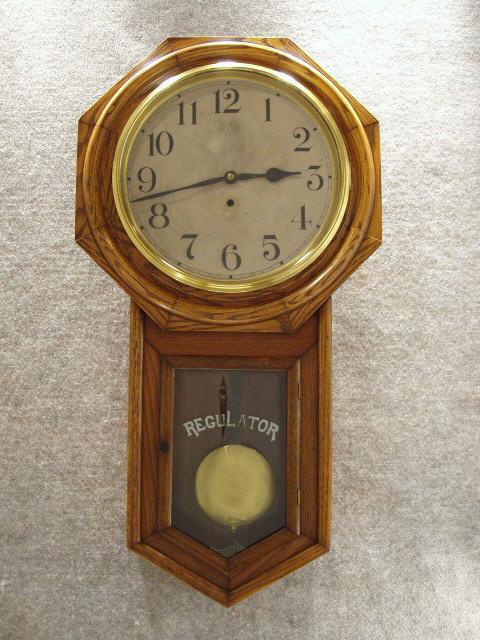 This Is The "Consort" Long Drop Timepiece By The Waterbury Clock Co. Circa 1910-1915. The Oak Case Has A Raised Oak Circle On The Octagon Top. Silver "Regulator" Is On The Glass Of The Lower Door. The Paper Dial Is Original With Roman Numerals, The Brass Bezel Is A Replacement. The Brass Pendulum Bob Is Visible Thru The Lower Door. The Movement Is An 8 Day Springwound Timepiece. Height 31" X W.-17" X Depth 6"